In the vinyl era, artists would often release one or two 7" singles prior to the release of their album. In the digital download era, Meat Beat Manifesto has offered up a second song for download from the forthcoming album, 'RUOK?'. "Supersoul" is now available at the site. Check it out! "Eye Spy With My Little Eye" is now available for order from Subconscious. The limited edition release contains nine tracks of outtakes and rarities recorded from the joint venture between Skinny Puppy and Legendary Pink Dots members. Jon Whitney will be performing as R in Providence, RI on Sunday, September 22nd at the AS220. Deutch Nepal and Der Blutharsh headline that night, with a number of other performers both local and international. For more information, go to www.as220.org. Brainwashed is happy to report that longtime brainwashed friend and all-around cool guy Ben Goldberg has announced that his humble label, Ba Da Bing!, after numerous years of existence, finally has a web site! You might remember his label for classic releases from Windy & Carl, Landing, and the legendary Badaboom Grammophon book/CD series. Check out www.badabingrecords.com. Yay Ben! The first full-length (non CD-R) CD by Mirror is already in danger of becoming another rarity (like their previous limited vinyl releases) just 4 weeks after its release. [The disc is already sold out from Idea and is in stock at only a few online stores at the time of the publishing of this article.] Christoph Heemann (of H.N.A.S., C93, Mimir, and Nurse with Wound fame) and Andrew Chalk (New Blockaders, Organum, ORA) certainly know how to attract a loyal following. Recorded back in August of 2001, this 41-minute track is a deep space journey without the sci-fi gloss of Star Wars et al. Their drone journeys are more like travelling in some old and lost (maybe Russian) space ship that's unable to change its direction while the life supporting system is running low of energy. The aim of the mission may be forgotten but undefined waves of sound shake through the last remaining passengers. Shades of memories are evoked: isolation, apathy and hopelessness dictates the mood. Any conventional form of communication broke down long ago. 'Solaris' can either be a soundtrack for a late-night listening, an out of mind experience, or a calming, reassuring, post-traumatic remedy (like after your lover left you in anger). As David Sylvian has put it two decades ago, "the doubt inside my mind comes and goes but leads to nowhere". - carsten s.
Ms John Soda, "Drop = Scene EP"
Cursor Miner, "Explosive Piece Of Mind"
This debut full-length from Rob Tubb, who must surely be Chichester's premier retro-electro crooner, follows his recent "Remote Control" single, also on Lo Recordings. While the electroclash cultural blip has made me wary of contemporary musicians who pay overt homage to the 1980s, I've plenty of time for those working in a more underground, principled, fashion (for example Gerhard Potuznik). Cursor Miner is definitely to be counted amongst the most interesting of such musicians, fabricating something original and fun from the lighter side of 1980s English synth-pop and the geeky, meticulous side of modern electronica. Instead of just dropping a ponderous vocal on to a club-friendly beat, he deftly merges the electro-pop basics of warm, resonant keyboard riffs and fey vocals with up-to-the-minute production work that's manic and crisp. The package is completed by a nice line in retro-futuristic lyrics, most notably on the single "Remote Control" itself, which ironically feigns both wonder at, and fear of, modern technology. Phobos 3, "Melody For Sleep"
Nightmares On Wax, "Mind Elevation"
Oren Ambarchi, "Der kleine König" / Keith Fullerton Whitman, "Live (at the Tremont Theatre)"
Oren Ambarchi is one of the busiest new composers around. Sadly, his work on this 7" does not stand up to his reputation. Compared to a number of his more theoretical releases, the songs here sound somewhat shallow and unimpressive. Produced with analog equipment (or trying to mimic such gear) "Der kleine König" consists mainly of a slightly distorted naive melody line. On "Links!," he pushes the frequency range into more uncomfortable regions at first, but lets it fade away in a repetitious wave which ends abruptly in some pitch bending. Both of these tracks could easily be excerpts of a recording session from years ago that just marginally escaped the eraser button. Experimental electronic recordings like this are both average and overdone these days. The simultaneously-released Keith Fullerton Whitman 7" features two edited parts of a concert from March, 2001. "Part One" sounds surprisingly reminiscent of a soundtrack (like the Sonic Youth score to 'Made In USA'). Guitar and loads of processing provide a moody setting which, to me, could go on much longer without ever getting boring. "Part Two" takes off with electronically-altered layers of sound until the guitar resurfaces in the middle part, only to be buried again in an effects-assault conclusion. This one's indeed a pleasure to listen to. Whitman shows a clear concept in composition which puts this release up with the best that 2002 has had to offer yet. Get it while you can. Both singles are (as all Tonschacht releases) limited to about 500 copies and come with an info sheet. - carsten s.
Drekka, "Take Care to Fall"
Vincent Gallo, "Recordings of Music for Film"
An electronic show of this magnitude only comes to Atlanta once every few months, so even though I hadn't heard much recorded work from a few of these artists, I knew that Eyedrum would be the place to be (and it usually is) for chance-taking electronic tunes. Local openers Knamiproko are a three-man musical ensemble whose live performance mode, as near as I can tell, involves 'jamming' over some pre-arranged beat patterns and chord structures. Backed by local video artist Shana Wood, Knamiproko played for what seemed like a very long time. While I'm interested to hear what congealed studio versions of their jams sound like, they still seem to be trying to find their rhythm live. Richard Devine, local IDM luminary who was scheduled to DJ to open the show apparently showed up late and only got his iPod/Laptop DJ set up rigged after the opening act. His 'set' consisted of glitchy beats and pitch-bending synths, all of which were nice in a head-nodding kind of way, but none of which were identifiable as a particular artist. If live musicians get upset when DJs take center stage to play records, I can only wonder what DJs must think of a guy who gets booked to play mp3 setlists from his iPod! After a rockstarishly long interlude in which it seemed like the members of Telefon Tel Aviv were in absolutely no hurry to get started, the lights dimmed and the respectable crowd poured in for what was to be the main act. The band of guitars, bass, keys and laptops launched into their signature set of soothing melodies and DSP beats, and the crowd rocked back to listen. TTA came across as a groovier version of Slowdive with 2002 style glitch beats, without ever sounding forced. It was a sound for the moment, to be sure. I couldn't help but wonder though if the same group of guys wouldn't have written the same exact batch of songs in 1995 using scratchy trip hop loops, and if they wouldn't be writing a similar batch of songs in 5 years using whatever new software will be available at the time. All speculation about TTA's place in a stylistic timeline aside, they put on a great show and even got coaxed into an encore by enthusiastic fans. Patriots Day, April 19th. This holiday is rich with Early American cultural history. http://www.world.std.com/~adamg/patriotsday.html Bush Announces the formation of Patriot Day, Sept 11th. http://www.michigan.gov/gov/1,1431,7-103--50849--,00.html "Two holidays with the same name? Priceless. Thanks, W, you jackass." - Jeremy Labrosse. We're not talking about our own website here, take a glance at these qualifications to see what you probably already fear: http://www.buzzflash.com/contributors/2002/09/05_Stepford.html. Subject: A comment regarding the recent poll. 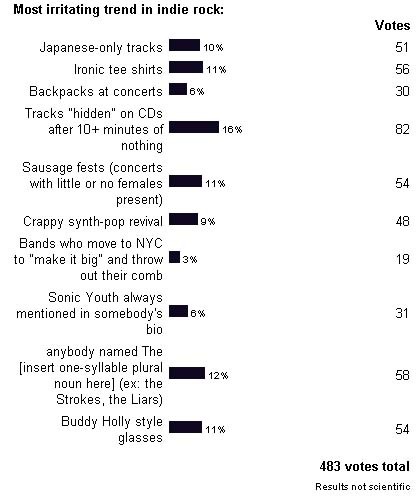 It seems that most people don't like noise artists that take themselves too seriously. I, to a certain degree, can understand and agree with that. And ultimately, it's just one opinion versus another. As a noise artist (though i don't limit my work to noise, I find myself returning to the style, because I love it), I feel that there are a few caveats to this generalization. I'm not saying this to put myself, or my opinion above anyone else's. I hold an equal grudge against improvised music, so I'm no better. But there is this: For the most part, particularly in experimental music, the artists make the music for themselves. It's masturbation; making the music that they want to hear. I'm glad when someone tells me they like a song, because that seems they like a part of myself, but I'm not hurt when they don't. However, to a degree, a certain level of self-involved seriousness needs to be present for the music to be any good. Yeah, it's pretentious, arranging static in classical-style structures, but without the pretense, there wouldn't BE the music. The world doesn't force feed you Ligetti and Cage, you need to put forth effort to understand it, and to interpret it and take it (hopefully) to the next level. So, yeah, taking yourself too seriously is bad (that's part of why I work under a silly name, despite it hampering me from getting shows around town), but to a degree it's necessary. This IS art, done for art's sake, not to make a quick buck. If no noise artist took himself seriuosly, then the world would be filled with generic house and soulless pop songs. Ultimately, it's not about money, or being respected, or building a community. It's about the music, and conveying an idea or an emotion to someone else, consciously or subconsiously. That doesn't mean I can't laugh at my work, or mock my chosen form of expression, but that I have to love and respect it. At least while I'm doing it. I think you mis-read the intention of that poll choice. "Noise artists who take themselves too seriously" isn't a generalization and does -not- translate to "All noise artists take themselves seriously." Regardless, the poll is meant for entertainment purposes, just like nearly ALL music in the Western culture we are part of. And if you're still unconvinced, try organizing a concert for Zbignew Karkowski some time! There's one on the brainwashed home page. where is nick kershaw's "would'nt it be good"
Probably on his albums or some trashy 1980s comps. do you know where i can find the 'near-mythic' list of NWW's favorite records on line? I lost it and I figured you had it on you site, but no luck. There's a list on the web site which was a list of Influences written on the first album. Of course, I'm sure Steven Stapleton has been influenced by many more things in the 24 years since. do you think he really writes stuff that way, or does he have some translation software 2 turn words into gibberish 4 him? u and i may never know. Ms. John Soda - No P. or D.
Jon Whitney, Arlington MA, listening as he drives celebrities around over the weekend.